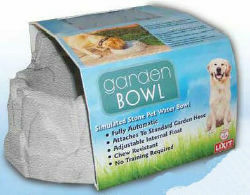 2 liter simulated stone pet watering bowl is low maintenance, easy to use, and worry free. It is fully automatic: attaches to Standard Hose. The unique waterfall design helps oxygenates the water as it gently cascades down into the bowl.